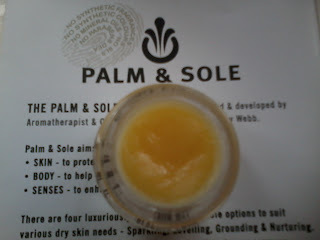 Palm & Sole is another one of my Twitter discoveries. They kindly sent me a sample of their Nurturing Balm. To give you some background the Palm & Sole range was created by Aromatherapist & Complementary Practitioner Kathy Webb and is handmade in Norfolk. Products are pure and organic (where possible) and free from parabens, SLS, artificial colours or fragrance and mineral oils. There are four options to the collection of products - Grounding (calm & relax), Levelling (balance & harmonize), Sparkling (revive & uplift) and Nurturing. Each option is available as a balm, solid moisturiser, facial oil and a body, bath, shower & scalp oil. I was sent a sample of the Nurturing Balm which is recommended for Dry & Sensitive skin. It contains Palmarosa and Norfolk beeswax. 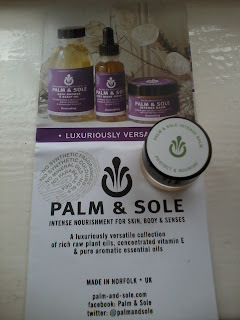 I have discovered some lovely balms since writing my blog and Palm & Sole joins that growing list. This particular balm is neutral in fragrance so perfect for those with extremely sensitive skin or if you simply prefer unfragranced products (I do pick up a hint of honey scent). The texture and consistency is as you would expect. It melts into the skin and feels smooth but not heavy. I have happily applied this over eczema patches and I enjoy using it as a lip balm. In general I find balms extremely helpful in treating my dry skin and this one is very effective. Overall, I highly recommend Palm & Sole to anyone who needs to give their sensitive skin a boast during the winter months and beyond. If I compare this one to Balmology and Natural U, there is no difference in performance. I would not be able to choose a favourite between the three balms. I think it boils down to what ingredients you prefer using on your skin and perhaps the essential oils you enjoy. 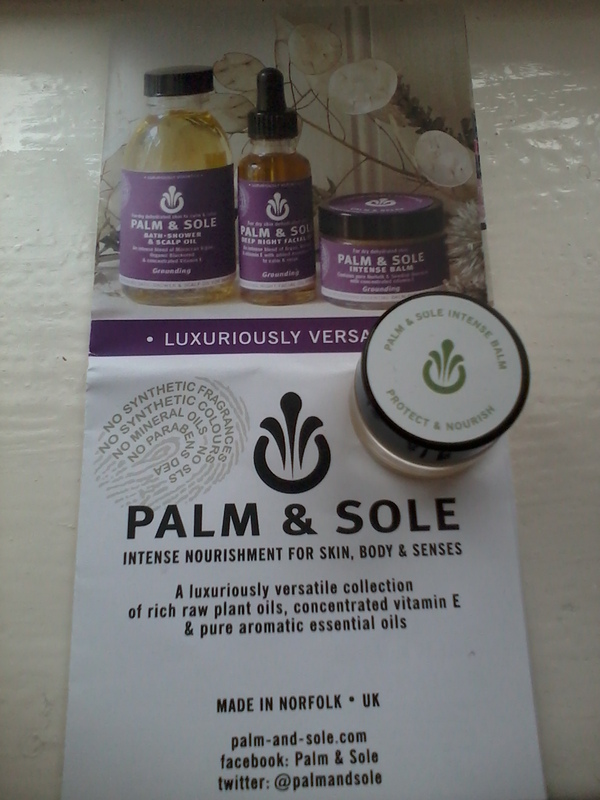 If you would like to purchase Palm & Sole products then you can do so via their website or if you live in Norfolk they are sold exclusively at Jarrolds. Has anyone else tried Palm & Sole? What did you think? Disclaimer - I received a sample free of charge, I am not being paid to write this review, all opinions are my own and links are not affiliated. I agree, definitely give a natural one a try. I know a lot of people rave about EA Eight Hour Cream, but it was originally designed for horses? Mineral oils may feel like they are treating the skin but it's a temporary effect. I have found so many great brands through Twitter, it's proving better than searching through Google.